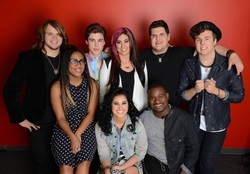 #AmericanIdol top 7 - U pick 'em! Last week was a good show, and it’s hard to beat the format last week, I really enjoyed David Cook. And the 80s. 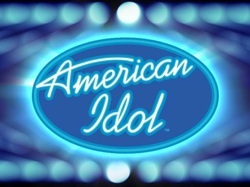 This week, the contestants have offered options for each other to perform. It’s a good idea and helps build good will among the contestants. They really are rooting for each other, and these song selections prove that. Caleb: “Family Tree” - In some ways it’s a good thing that he’s doing a non-popular song from a popular band - it helps us see him in his own right as a viable performer, and not a meatloaf mimic. It was strong. He’ll be back. Jessica: “Gunpowder & Lead” - I really don’t think she will be able to fully release and develop where she needs to without time and maybe even some therapy, but I do think that that was her strongest performance thus far. She sounded great, she was credible singing the lyric, and she didn’t try to move in ways that she wasn’t capable. Sam & Alex: “Let Her Go” - Must they Mraz everything? CJ: “Gravity” - This is a great song pick from Caleb that might just keep him alive for another week. Now he has to figure out how to sing, emote, and give it his all without scrunching his face into oblivion. A little sharp here and there, probably still in the bottom. Dexter: "Muckalee Creek Water” - This works for me the same way that Caleb’s number did - not familiar with the song, so it sounds like an original successful Dexter number. Solid. Alex: "A Team” - Just the right amount of integrity to the original melody and unique tweaking of an inventive artist. Sam: "Sail Away” - He’s kind of imitating David Gray right now. Not sure what I think about that. It is interesting to have him sing a much more mature sounding/textured kind of song. Not sure it worked, but it was interesting to see. He certainly sounded good. CJ, Jessica, Dexter: “Compass” - not much to say about that. Jena: "Creep” - Very solid performance. Enjoyed the arrangment and the attack of her voice. She’s real. Is she a superstar? Not sure yet. But she’s getting there. I think it might be time to shorten to an hour and a half and cut out the duets and trios… What did you think? Who is going home? I’m glad that they are having a mentor this week with David Cook. I was missing the vibe of hearing feedback from anyone besides Randy Jackson in the video pieces. However is it me or is all of David Cook’s interview footage ever so slightly out of focus? Jena: "I Love Rock and Roll" - Great arrangement, great decision to double up the verse before getting onto the chorus. The tension and build up was exactly what she would need to pull it off. Dexter: "Keep Your Hands to Yourself" - Perfect 80s pick for him. Not sure why the drummer played through the stop in the first verse, but he did it again the second time so it must have been a choice. I didn’t like it. My only criticism was that the last time he sang the end he dropped the word “don’t” which massively changes the meaning of the lyric. But he had fun. Malaya: "Through the Fire" - Your shoes are from the future. The whole sitting on the piano and walking down the stairs was totally unnecessary and in my opinion got her started on the wrong track for the first verse and chorus. But after she hit that high note the first time thru to the end was a powerhouse. I think she overshot it by about 18 percent. Youngness got her a bit. So I have to say that so far David Cook has done a great job mentoring, and the clips of his feedback are fantastic. How come they haven’t been able to capture moments like that of Randy Jackson? Because they don’t exist…. Jena & Caleb: “It’s Only Love” - Holy smokes this is a boring song. Not even that dress could save this performance. Not a fan of the song, though they connected well with each other. Jessica: "Call Me" - Well if other weeks hinted at Leather Tuscadero, this week flat out megaphoned it. This was the most comfortable and confident I’ve ever seen her out of the comfort zone, and that is commendable, but even then it had shades of awkward. Her voice maintained stability throughout. JLo’s critique of Jessica was the best feedback to a female contestant from any female judge that has ever been on any season of AI ever. Fantastic. Sam: "Time after Time" - Sam’s in trouble everyone! Bring in the tweens! He is doing better in the category of connection, and I love this song. The stripped down arrangement is lovely, I was worried that it would feel too fast, but it was very nice, and the BGVs on the chorus may have just earned him another week. Malaya & CJ: “I Knew You Were Waiting” - I’m sorry but I still don’t get CJ. I keep waiting for someone to come over to him and kindly let him know that he is in the wrong room. Alex: "Every Breath You Take" - This is a fantastic arrangement. This dude is a real artist. I loved the PLEASE… hold, although he was a bit flat with it. This is one I may have to download. What a fantastic piece of recorded music. Harry, this is the first time I think that you are wrong when you are trying to parse Performer and Entertainer with Alex. The issue here is one of youth, and inexperience, not one of category. The fact that these kids haven’t figured out how to excel into the bigness of the stage and take it and own it (which they haven’t fully yet), is totally on the judges and on the producers for not grooming them to the point of entertaining. It’s a TV show for our entertainment, not for performances, and that’s on the judges. Jessica & Dexter: “Islands in the Stream” - I can’t really take this song seriously either, as it was performed by Kenny Rogers and Dolly Parton but written by the Bee Gees. They’re playing it as fast as possible to get it done as quickly as possible. CJ: "Free Fallin’" - I’m really surprised that this song was 80s. Must have been ‘89. I just checked. It was. As much as in general I don’t usually like CJ or think he belongs (see earlier post on the duet), this was pretty good - he connected his signature attack with the lyrics, and the intimacy of the verses in the first part earned the right to go off the rails in the last chorus. I didn’t like it going back down for the ending. Lost momentum and with the repeat of lyric didn’t mean much. Caleb: "Faithfully" - The pianist just botched that opening riff. As an 80s boy going to church, that was a sin. Pyro? I actually really enjoyed that, he didn’t do much different than the original, so in that respect he honored the song. What was up with all the close ups of lip synching JLo? So to Keith, Journey is functional like a fanny pack? What did he just say? I think he had a Paula moment. Who is going home? Did Sam do enough to save himself? It’s "I’m with the band" week! I guess that just means the band is there. It’s not “big band.” Don’t panic. I think so far this part of the show is suffering from a over-promise and under-deliver. Each of these potential stars seem to be a bit of deer in the headlights, and all the promise of the new judges is long gone and used up. I still think there’s the possibility that a genuine star can rise from this group, we just haven’t seen a journey with any of them. 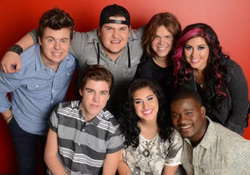 When I think about the growth curve we saw back in the day with a Carrie Underwood, or even a Scotty McCreery, you just don’t seem to see that kind of evolution with this group. It’s just kinda there for them. Someone needs to break out of it. Alex: “Don’t Speak” - fantastic beginning. He’s turned No Doubt into Jason Mraz. Loved the arrangement. This was great, but just imagine how much better it would be if he gave even one dynamic facial expression. Majesty: “Shake it Out” - This arrangement feels like Whitney + the Machine more than Florence. That romper isn’t helping. Of the ones left, she does have spark in her eyes and has the potential to grow into a star. But she has been better than this. Dexter: “Boondocks” - This was a great pick for him in that it feels just like what he should be doing. I still would kill for just any contestant that looked like they had something going on in their eyes. Malaya: “The Long and Winding Road” - Lisa Bonet from a Different World? Anyone? She did very well. I like her and of course, it’s a great song. I still question whether or not she can survive the long haul, but my prediction would be that if she goes home and the “save” is still in play, the judges would use it on her. Sam: “Hey There Delilah” - I think the light choices for this song were manipulative and an unfair advantage for mister dreamypants. And JLo’s face proved it. He did fine. But again, I am waiting for someone to come out of their well-polished shell. Jessica: “Rhiannon” - I like the choice of a Fleetwood Mac tune, but I might have chosen a different one, like Silver Springs or Dreams. She sounded great and she was very comfortable onstage, the vibe of the song though was a little too wispy to be memorable over time. CJ: “If It Hadn’t Been for Love” - Okay, that’s enough, he is not even singing anymore. He was so sharp on that chorus that I got a paper cut. Sometimes raw talent is just raw. Caleb: “Dazed and Confused” - This was the best performance of the night. A perfect pick for a Zep tune, and if they cut to Jlo dancing one more time they're going to have to pay her choreographer a royalty check. It was the perfect pick because it was rock but it was also blues and gave him the opportunity to wail and make the song his own within that structure. Fantastic. He is the only one who is evolving. Jena: “Bring Me to Life” - I thought this was a great performance. She is evolving too. Especially with the false ending moving into the money notes at the end. Strong. Enjoyable. She almost got to Caleb level. They would make a great double bill. CJ. He’s got to go. That is all. 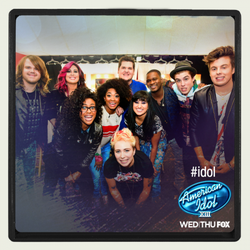 The ones who have a shot at becoming stars are Caleb, Jena, Majesty and Alex. Here are my thoughts on each performer, brought to you, as always, prior to hearing any of the judges’ feedback. Sam: “Come Together” - So what movie is this from? Across the Universe? Yep. He gets points automatically for not saying “eyeballs” - but while I love this song, I’m not as much a fan of the tempo he has selected for the verse - or at least the arrangement - it’s missing the mystery and the levels of the original. Feels a little karaoke, but he’s gonna be fine. Jessica: “The Sound of Silence” - Even with the goofiness with the drum coming in on the wrong beat, she did a fantastic job. That was absolutely wonderful. My only feeling was that I wish she hadn’t told us that she did this back in her set. Harry did a great job of simultaneously calling the band out and also giving them props for being great. Live theater, things go wrong. It doesn’t mean that the drummer’s a schlep. Side note: Ryan and Randy completely ruined a perfectly good improv game just now. I’m so sad. Dexter: “Sweet Home Alabama” - Looks like they didn’t want to let him talk before singing - oh, and apparently he’s dating Xanadu. But he sounds fantastic, and I really like him a lot - my only problem is that from week to week I can’t remember his name. This was really good, but I think it translated a lot stronger in the theater than it did on television. Ben: “Bennie and the Jets” - Look. Purple Rain is from a movie. Footloose is from a movie. This is not from a movie. 27 Dresses is not a movie. I like him fairly well, but I wasn’t crazy about this song selection. It just didn’t seem to jive with anything we had learned thus far about who he is or who he might be as an artist. Majesty: “Let It Go” - This song is suffering from the cuts necessary to fit the format of the TV show. Also, it’s a really difficult song made famous by one of the most epic voices of our generation, and you just can’t go to head voice for the big note. But hey, it’s definitely from a movie. She’s gonna be fine, but this was like watching a gymnastic event. Caleb: “Skyfall” - You are my friend to pick this song to sing. See now this makes me want to hear Meatloaf cover this song. Love the anticipation of the first verse, just waiting for him to blow it out. He’s gotta get to it soon though. So I think from an arrangement standpoint I might have liked this more if he had rocked out the arrangement as well, with electric guitars attacking with strong bar chords - but the last few phrases were absolutely fantastic. Front runner. MK: “To Make You Feel My Love” - getting away from the true movie songs…. It’s like she knows what the problem is - that she can’t break through out of her skin to reach out, so she walks over to the judges hoping that some of her is going to jump out - but even though I still feel like she doesn’t have it, I will say that was the purest vocal I’ve heard her execute. While I am disgusted and disturbed by the contestants reenacting scenes from films alongside their voting numbers, I appreciate the fact that the show seems to have no plans to mention or reference it. Alex: “Falling Slowly” - Love this song, which is actually from a movie. I thought he did a great job, this was a great way of combining his quirkiness with something really accessible. Jena: “Decode” - This arrangement certainly did not need a piano - I really liked her performance, but in general I wasn’t really into this song itself very much. It just didn’t seem like she understood the song, and was kind of posing through it - felt like an age gap issue. I also think that a mood song like this doesn’t seem to tell a story as clearly, and again, is harder to pull off without enough age to give it texture. Malaya: “I Am Changing” - I appreciate that she didn’t do “that song” from this movie, but unfortunately, that’s the best song from this movie… So I thought she did a great job in general, but even more so than the last one, “leave my past behind” is a lyric that doesn’t make sense coming from a 16 year old. But wow, what an ending. 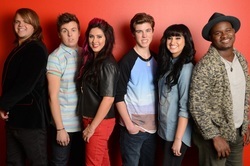 Ben, MK, and Jessica are in the bottom three in my opinion…. And either Ben or MK should go home… what do you think? It’s the top 13 y’all! Well, I know it’s a new day in AI land when I was jonesing for this episode on Tuesday night, only to discover that I would have to wait until Wednesday. Why do they torture us so? Once again, I have to hand it to the format adjustments they have made. The road to the top 13 has successfully weeded out those who really didn’t have a chance to succeed and get to #1 week after week, while letting us get to know many of those who are in the top 13 and who we will be rooting for week after week. Yes, there were some who went home last week that I liked, but I already can’t remember their names, and that has to count for something. So here we go - I’m writing it as I see it, and as always, before I hear anything that the judges have to say about any of it. I’ve been pleased to note that last week my thoughts were very similar to those of mister Harry connick Jr, and that is great company for this season, that’s for sure. “This Is Me” is the theme - hmmm… This is really putting the song choice under the microscope. Dexter: “Aw Naw” - This was like big and rich without the big or rich. Well, maybe the big. Kinda boring, not particularly inspired. I like rockabilly pop country at some level, but this was too karaoke for me. Malaya: “Runaway Baby” - Well so far the contestants are 0/2 on song selection. This is not a song for a female to sing - this seemed like a “sleepover lipsync” jam session. Not good. Too much for her to handle. Kristen: “Beautiful Disaster” - So she does pick Kelly Clarkson, but she picks the least known, unhummable song she ever recorded, from the album that everyone told her not to make. Hmmm. This is me indeed. So far I am not impressed with how the nerves are impacting these performers. So Harry thinks there is something going on with the sound mix which is why the first three have been performing out of tune. Quite possible. But I think it’s more nervous energy and lack of experience. Ben: “Folsom Prison Blues” - He’s the first one so far to seem to sing within himself, and to actually seem to embody the notion of “This is Me” - My only complaint is that a baseball cap isn’t great for lighting to see facial expressions and whatnot. But this was fast, furious, and fun. I don’t think I can hear Ryan keep saying “Head on over to the lounge” week after week. They need to rename it or give Ryan more ways to say it. CJ: “Radio” - I haven’t heard this song before, but Hootie sure has taken a page from Everclear’s book - isn’t this just a countrified version of “AM Radio?” This one was slightly better than Big and Poor from before, but it was still not that great. He needed to enunciate in that rapid-fire chorus. I still like this guy in that I love the offspeed pitch of his style and what he’s passionate about. MK: “Satisfaction” - But not the one where you can’t get no. I actually like her voice a lot, but she has absolutely nothing going on in the face. She is not connected with her voice and body. But I liked the song and I liked it in general. Majesty: “Tightrope” - Everything that Malaya was trying to capture by choosing “Runaway Baby”, Majesty has achieved and then some with this song pick. She stayed within herself, nailed the vocal, kicked tail and took names. Fantastic. Jena: “The Scientist” - I like Jena, though I feel like she is vowel-challenged. Some of her choices for replacement don’t seem to be linked to accent or region, and they seem like a affectation that doesn’t seem authentic at times. But man can she belt. Alex: “A Beautiful Mess” - Great pick for him. He is a diamond in the rough, what a clean and pure voice in the midst of a quirky artist hipster-nerd frame. Did lose the pitch a bit at the end for sure. He’s like a Bob Dylan with Art Garfunkel’s voice. Emily: “Glitter in the Air” - She sounds great, very old school. She is calm and gets to the high notes with ease. Beautiful I thought. Sam: “Unwell” - I almost feel like Sam and Alex should join forces and become the Simon and Garfunkel of the next generation. He’s great, but he isn’t doing anything revolutionary with this song, it’s not turning into a moment the way that Emily, Jena, Majesty or even Jessica did. Boring, but OMGoodness he’s cute. Caleb: “Pressure in Time” - Well there’s some band in CA that’s going to have some increased download traffic on iTunes… Still wishing he had picked “paradise by the dashboard light” instead. This is a great song for his rocker-ness, but it’s more a song about the guitar hook than it was the melody. But wow, what an ending. He’s a confident rocker.